This twenty-three day programme covers all of Vietnam's main attractions including Hanoi, Ha Long Bay, Sapa, Hue, Hoi An, Nha Trang, Dalat, Ho Chi Minh City, and Mekong Delta. Enter Vietnam at Noi Bai airport, you will be met and driven to your hotel. You will have time to relax before we present you with Vietnam daily life in the past and now with one or two hour cylo tour around the Hoan Kiem Lake, Ngoc Son temple and Old Quarter of Hanoi. 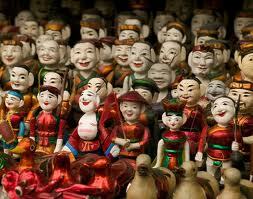 You will then enjoy a Water Puppet Show and a welcome dinner at a restaurant with Vietnamese cuisines. You will spend the night in Hanoi. You will have the whole day to explore Vietnam�s capital city. 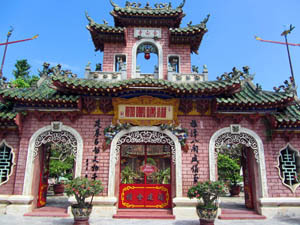 Your guide will take you to the Temple of Literature, the first university in Vietnam dating back to the 11th century, and a popular attraction, as is Ho Chi Minh�s Mausoleum, his simple stilt house where he lived and worked, and the museum dedicated to his memory. After lunch, you�ll call in at the serene Tran Quoc Pagoda, the oldest in Hanoi and the excellent Ethnology Museum for an overview of Vietnam�s 54 distinct ethnic groups. Your overnight will be in Hanoi. After an early breakfast, you will leave for Ha Long Bay, one of the most spectacular UNESCO World Heritage Areas and the world�s largest marine limestone �karst� landscape. There you will board your boat, a wooden junk built from the model of the old Vietnamese court vessels with sails, a wide transom and rectangular superstructure, that will take you first to the busy World Heritage area and then to some of the less well-known grottoes and caves. Weather permitting, you will be able to swim, fish, climb a hill for an overview of the Bay�s remarkable seascape, or venture into some of the sea level caves in a small sampan. All your meals will be provided on board, usually based on fresh seafood. Your overnight will be aboard. 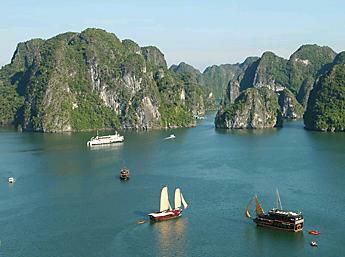 You will spend the morning cruising Ha Long Bay, followed by lunch just before docking around noon and leaving for Hanoi. 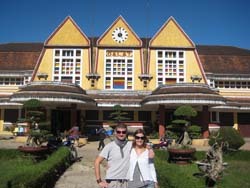 In the evening, you�ll be transferred to the railway station to overnight train to Sapa. Arriving in the Lao Cai Railway station at 5am. 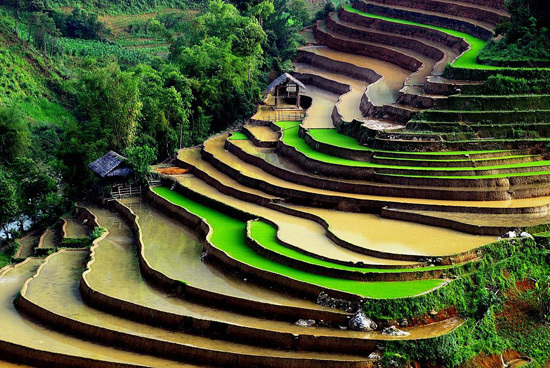 You�ll be transferred to Sapa. After breakfast, you will follow your guide to walk around the town, visit the town centre market before being driven to the Lao Chai, a village of the Black H�Mong ethnic minority people. 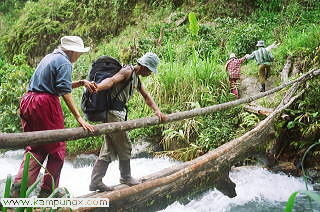 Trek around the village and then along the path to Tan Van of Dzay people. Pick lunch on at Tan Van village then continue trekking to Giang Ta Chai. Trek to main road and our car will pick you up back to Sapa. Your overnight will be in Sapa. 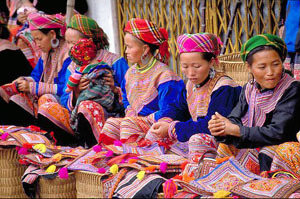 You will wake up early today to explore one of the colourful markets in Sapa or nearby Bac Ha. In afternoon, you will return to Lao Cai for overnigh train back to Hanoi. Your overnight will be on the train. The schedule of the local markets as below: Tuesday: Coc Ly Market Wednesday: Cao Son Market Thursday: Lung Khau Nhin Market. 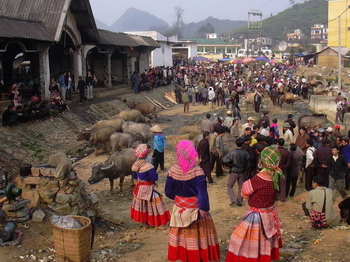 Saturday: Can Cau Market Sunday: Muong Hum or Bac Ha Market. Getting back to Hanoi at 5am in the morning, you will check in a mini hotel for breakfast and refreshment. You will then board an afternoon flight to Hue. 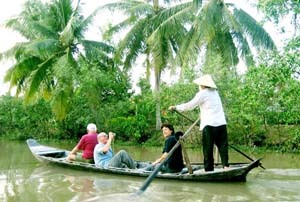 Arriving in Hue, you will be greeted by your guide and driven to the downtown for hotel check in. You will be free in the remainder of the day. Your overnight will be in Hue. Your morning will visit the Imperial Citadel of Hue and cruise along Perfume River to visit Thien Mu Pagoda and the Royal Tomb of Emperor Minh Mang. 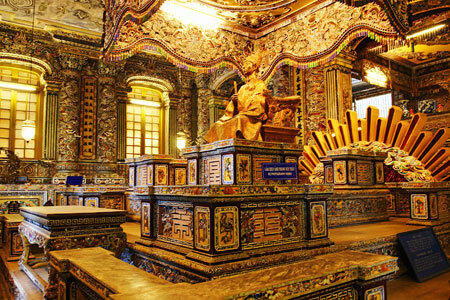 In the afternoon, you will visit the tomb of Emperor Tu Duc. 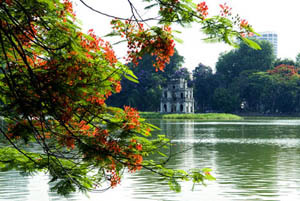 From there, you will return to Hue to visit one of the city�s Garden Houses, a unique feature of Hue. Your overnight will be in Hue. After breakfast, you will drive to Hoi An via the Hai Van Pass. Upon arriving in Danang, you will visit the the remarkable Hindu statuary in the Cham Museum before leaving for Hoi An. You�ll visit the ancient town including 400 years old Japanese Bridge, 300 years old Chinese temple, 200 years old Vietnamese former merchants�house before being dropped off at your hotel. You will spend the night in Hoi An. 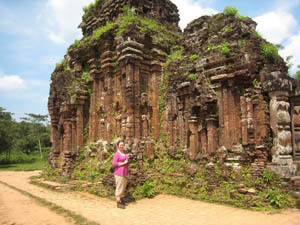 After breakfast, your guide will meet you at your hotel to take you to the World Heritage My Son Sanctuary, 40km southwest of Hoi An. Located in a lush valley, My Son was a capital and religious center of Cham people, now remaining with red brick towers and sanctuaries. When you return, the rest of the day will be free. 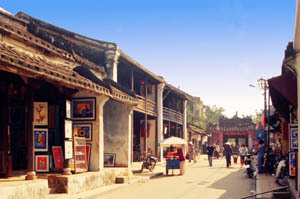 You will spend the night in Hoi An. The days will be free for strolling in the town, lazing on the beach, or whatever takes your fancy!!! 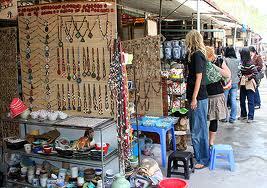 You will be free today until being transferred to the airport for your flight to Nha Trang. Arriving in Nha Trang, you�ll be transferred to your hotel for checking in. You�ll be free to relax on the beach. Your overnight will be in Nha Trang. 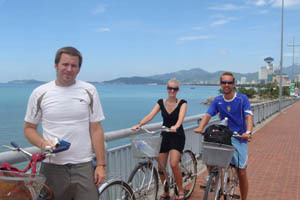 This excursion take you to visit a selection of the numerous attractions in Nha Trang City. 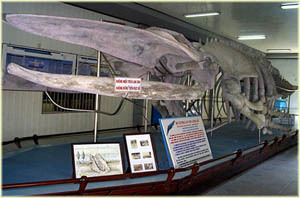 First the car will drive you to Cau Da for a visit the Vietnam Oceanographic Institute. 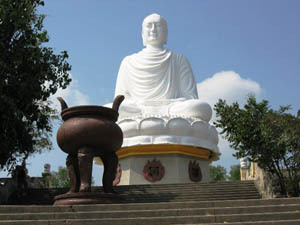 After that, you will go to Long Son Pagoda, Chong Promontory Rocks. After a brief visit to the impressive Ponaga Cham tower, you�ll be driven to the nearby Thap Ba hot spring spa. After relaxing in the mud baths and mineral water pools, you will be driven back to your hotel. Your overnight will be in Nha Trang. After breakfast, you will pick up a bike to cycle across the countryside around Nha Trang City stopping off at several villages, a working brick kiln and a good example of typical 19th century Vietnamese architecture en-route. You�ll meet local people, find out about their rural lifestyle and see how they earn a living. Your journey will take you across the rice fields where the farmers work with the water buffalos, and visit hamlets producing: rice paper, conical hats, woven rice-stalk mats, charcoal stoves. You lunch will be at a riverside restaurant. You�ll spend overnight in Nha Trang. In the morning, you will take a 5 hour drive journey to Dalat. Arrive in Dalat in the afternoon, you will check in your hotel and then be free for relaxing. Your overnight will be Dalat. In the morning, you will ride a cable car to Truc Lam Pagoda and Tuyen Lam Lake. 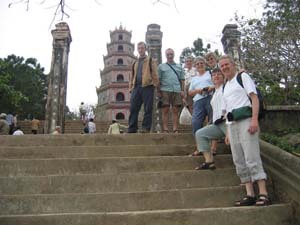 Truc Lam is the biggest pagoda in Dalat standing in Phoenix Mountain about 1,300m above the sea-level. It�s surrounded by an attractive flower garden and with the view of pure water lake and the pine forest on the far side. After lunch at local restaurant, you will visit Emperor Bao Dai�s Summer Palace, Crazy House, Dalat Railway station and Dalat market. 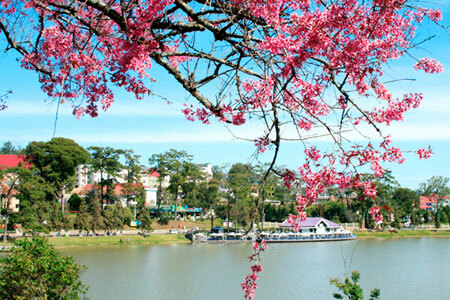 You will spend overnight in Dalat. You will be free in the morning until your car and driver arrive to take you to the airport for your flight to Ho Chi Minh City. When you arrive, a private car will be waiting to take you to your hotel in the city centre. After checking in, you�ll be free for a preliminary wander around District 1. 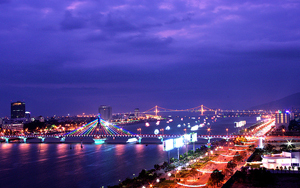 Your overnight will be in Ho Chi Minh City. After breakfast, your guide will arrive to show you around Ho Chi Minh City. You will visit the History Museum, the Museum of War Remnants, the Notre Dame Cathedral, the Centre Post Office and the huge Ben Thanh market, one of the liveliest areas of Ho Chi Minh City. 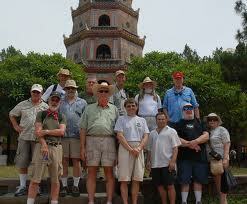 After lunch, you will visit China town, Binh Tay market and Thien Hau Pagoda. You will spend the night in Ho Chi Minh City. A morning drive will take you to Tay Ninh to visit the temple of Cao Dai and attend the fantastic mid-day ceremony. 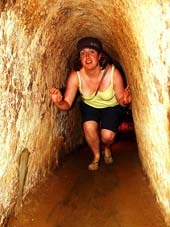 After lunch, you�ll visit the famous Cu Chi tunnels, a byzantine maze of underground passages, chambers, rooms and booby traps used by both the Vietminh and the Viet Cong to suddenly materialise as if from nowhere, launch a lightning ambush, and vanish equally rapidly. Your overnight will be in Ho Chi Minh City. After escaping from Ho Chi Minh City�s urban sprawl, you�ll travel to Vinh Long. 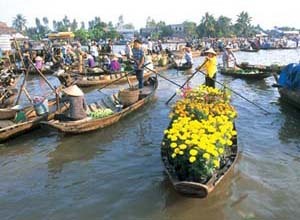 There, you�ll cruise on the Mekong River, visit Cai Be floating market, fruit orchards, a traditional family-run brick kiln, and drop in to look at some traditional cottage industries - a workshop making the huge coffins unique to the Mekong is particularly interesting. You�ll sleep in a family house in a canal-side orchard. The day begins with boarding a boat to cruise to Cai Rang and Phong Dien floating markets on the Mekong Delta � both the journey and the markets provide insights into the Mekong rural lifestyle. Take in the beautiful scenery and the daily activities of the locals who lives along the Mekong canals and you will roam through the village to visit a rice husking mill and a rice noodles making shop. You will drive back to Ho Chi Minh City in the late afternoon for overnight. Your overnight will be in Ho Chi Minh City. After breakfast, you will be free until your driver arrives to take you to Tan Son Nhat airport for your departure flight. Breakfast and accommodation sharing a twin or double room. Travel in an appropriate private air-conditioned vehicle with an experienced safe driver. The services of an experienced English-speaking guide throughout the tour (please note: guides will be on hand from pick-up until guests� return to their hotel or reaching their destination). Boat cruises as specified in the programme. 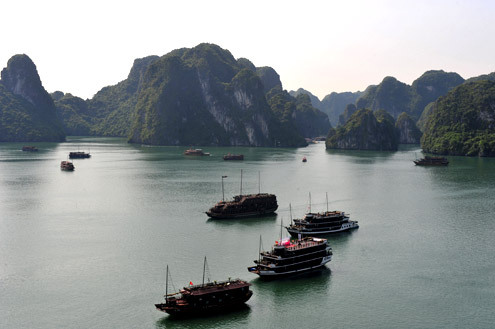 All Ha Long Bay boats will be fully licensed and comply with current safety regulations. 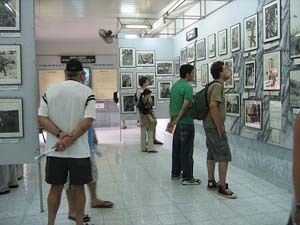 Where necessary, entry fees and permission to enter border areas for all visits mentioned in the programme. Lunches and dinners (as specified in the itinerary) in the best local restaurants, or picnics where no suitable restaurant is available. Visas + Dinners, except as specified above.